Situated in Yavapai County a mile high in the mountains of Arizona, between the central and southern Arizona desert and Northern Arizona’s Colorado Plateau, sits Prescott, Arizona. Home to 41,000, Prescott is located in a “transition zone” and is also home to piñon pine, ponderosa, and juniper. Prescott Farmers Market proudly serves Prescott, Chino Valley, and Prescott Valley residents, and has become a local fixture and consistent presence. The absolute stars of PFM are the market farmers/producers. PFM’s three markets consist of farmers that transition through the seasons to offer what harvest and hard work has rooted in their grounds. From interviewing Kelley Villa, Market Manager, and reading through PFM’s website “Meet the Farmers” page, I was overwhelmed with the commitment of market farmers and the resulting importance and appreciation they receive from the community. Also impressive is the span of land these Arizona farmers/producers utilize. Farmers at Maxwell Gardens operate on less than 2 acres while ranchers at Broken Horn D Ranch have 4,000 acres under their belt. Each farmer has their own story, but all have a shared sense of purpose and love for what they do. Customers have come to relish the fruits (or veggies, meats, dairy, etc.) of farmers’ labor, and enjoy market seasonal favorites such as asparagus, spring’s first flowers, peppers, tomatoes, tamales, pozole, sunchokes, and 2 and a half feet long celery stalks. 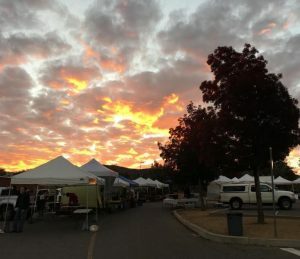 We at FMC are happy to turn over the Instagram reins to Prescott Farmers Market for the next two weeks, and urge you to learn more about the market and to follow their visual storytelling. Farmers Market Coalition: Give us a little bit of history on Prescott Farmers Market. Kelley Villa: The Prescott Farmers Market (PFM) is celebrating its 20th year of operation. It began in 1997 in downtown Prescott with a handful of growers and has grown to host more than 50 vendors at the height of the summer season. In 2014 PFM launched a winter market based on requests from local growers and food vendors. PFM now operates this year-round market in Prescott as well as a summer market in Chino Valley and another winter market in Prescott Valley. We are a producer-only market, which means that only people who grow or make their own products are allowed to be regular vendors. We also require that processed food vendors use a percentage of AZ-grown ingredients in every product they sell. PFM was originally a growers’ cooperative before receiving nonprofit status in 2012. Our organization has four part-time staff members and one full-time FoodCorps service member who teaches in local schools. Farmers Market Coalition: Describe your markets. KV: We are proud to accept SNAP and WIC at all our markets, year-round. We have also recently introduced Double Up Food Bucks, which offers a $10 matching incentive to customers who swipe their EBT card at the market. We have a featured fruit/vegetable each week in the summer, where we offer botanical information and cooking tips on in-season produce. Once per month in the summer, local chefs teach about how to use unusual vegetables, offering recipe cards and free samples while cooking on-site. Each week, our FoodCorps service member or partnering health education organizations (Slow Foods Prescott, University of Arizona Cooperative Extension, Yavapai County Community Health Services) coordinates an interactive kid’s activity, including seed-starting, vegetable stamps, and taste tests. Last summer we offered a $5 POP Club voucher for participation, thanks to a grant from FMC and Chipotle. FMC: How did customers respond to POP Club? KV: Kids (and their parents and families) were very excited to get $5 of their own to spend around the market. POP Club increased participation in activities such as our apple cider pressing event, taste tests, seed planting, and arts & crafts activities. Customers asked about the promotion thanks to press releases in our local newspaper, and were sad when the promotion was over in October. FMC: How do you promote your markets? KV: Over the past three years we’ve shifted our marketing budget from radio and print advertisements to focus more on social media, which in turn cut our marketing expenses in half. In the fall of 2015 we surveyed customers and discovered that more than 75% of people first heard about the market through word of mouth. This data confirmed that our marketing plan was on target. We use Instagram, Facebook, Twitter, a newsletter, small postcards, and our website to advertise. We also rely on community partner organizations to help us reach people from all backgrounds. We have developed colorful posters in partnership with local WIC staff to advertise FMNP. Community education partners at Yavapai County Community Health Services (our local health department) and University of Arizona Cooperative Extension help us by inviting students in their health education classes to “meet them at the market,” and even incentivizing attendance with coupons for free market tokens. FMC: Tell us more about PFM’s FoodCorps service member and how the member adds to the community? KV: PFM is grateful to host a FoodCorps service member for the 4th year in a row. The FC service member represents PFM in 3 area schools, building and maintaining school-based gardens, teaching garden and nutrition classes in schools, and sharing knowledge about local farmers. FMC: What are the seasons like in Arizona and how do the markets adjust throughout the year? KV: SUMMER: At the market and on farms, peak production time is July-August. This is when we see lots of variety and customers at the market, including crowd-pleasing types of peppers, tomatoes, and melons. FALL: The first frost around mid-September. In November, we switch to our winter location, which is smaller and still outdoors. Faithful customers follow us to our location at the hospital; we are there until April. However some weeks are pretty quiet, and it can be disappointing for vendors. SPRING: Traditionally Mother’s Day is a good guess for the last frost and a good time to start setting out baby plants, but in 2016 the last frost was tricky…it got warmer in mid-May and then frosted again in late May. The high altitude gives us warm days and cold nights. KV: The PFM does not have a permanent location for any of our markets, so we are in year-round negotiations with our hosts to ensure that our seasonal occupancy is agreeable to all. In 2016, the corporate parking lot policy of Walgreen’s changed, effectively evicting us 2 months before the Chino Valley market was set to open, despite local management welcoming us. Through brainstorming of board members and vendors as well as staff initiative, we were able to secure a rent-free partnership with Olsen’s Grain, a locally-owned feed store, right off the main road. Thanks to this highly visible new location and support from Olsen’s staff, we had our most successful summer season in Chino Valley. 2017 marks our 20th summer season in Prescott. In July 2016 we successfully implemented Double Up Food Bucks, which gives up to $10 a day in extra tokens to SNAP/EBT customers. These tokens are only for fresh, Arizona-grown fruits and vegetables, which means that this program directly supports our local farmers. FMC: What is at the center of the markets? KV: The heart and soul of our markets is the farmers. They are creative and resilient, despite the many challenges of farming in high desert Arizona. Access to land and water, mile-high altitude, relentless pests and unpredictable weather are only some of their hurdles. Many springs we receive a frost at the end of May so growing food here is always a gamble. We are so grateful for the people who grow food for our community; they are arguably the hardest working people. We are blessed to have dedicated farmers growing produce year-round to share with our customers, families, students, local restaurants and food banks.